I feel like these lamps have been reborn with Krylon. I know I got a great great deal on these babies @ $5 each how could you go wrong I know some people will say (and some on my friends did tell me) why change out the brass I just felt it was too heavy and weighed the room down visually and I wanted it to be lighter & brighter. Is that not what a lamp should do?? Lighten and brighten? Right? Since there were two lamps I got to do a side by side before and after. I don’t know why but I get very excited about that. It’s not often in a project you get to do that. And I totally think they are a FIT. Definitely makeover time. Time for them to stick around and brighten the place up. In more ways then one. I used Krylon metallic paint in silver. A few quick sprays over newspaper in my back yard did the trick real quick. the silver deff looks better then the gold..its more modern, more you ! Krylon is the best I tell ya. Love the new fresh look. Thanks for sharing. I agree, silver is the better look. 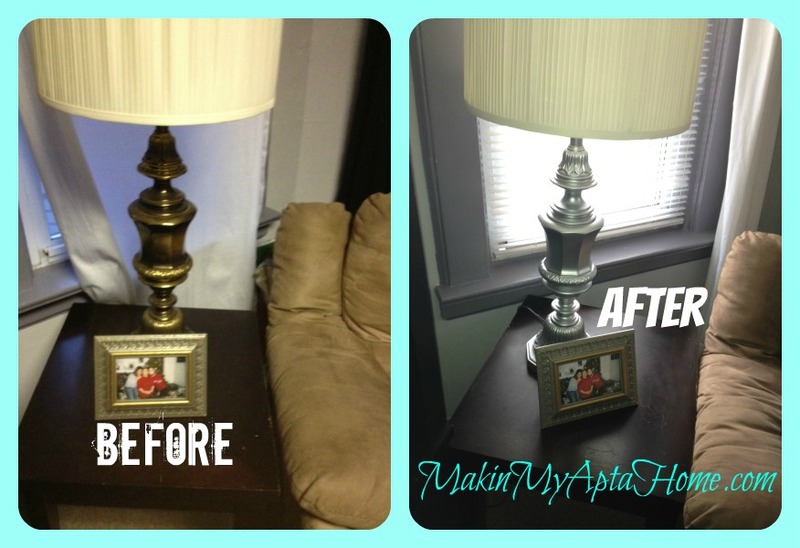 I’m loving the transformation of these lamps! They are adorable!!! So glad that I found you on Live. Laugh. Rowe’s networking party – I’m following you on Blog Lovin’, now! Would love to have you visit my site, soon! I love the new style – Its amazing what a great job spray painting does! I agree – looks much better in silver. It looks great! although I kind of like the before better. It just depends on what style you’re going for. One of my favorite blogs is Vintage Revivals and Mandi uses old brass a lot. I love her style. I love the after, so much brighter! I like to say if you can’t fix it with duct tape or spray paint, ditch it. 🙂 Thanks so much for sharing on Tout It Tuesday! Hope to see you next week. Much better! Yeah there is just something about that gold tone that I don’t care for either on many things. I think it came out great! Thanks for sharing at Cap Creations. Have a great week. I loved the before and after side by side pics! Way to banish the brass, I am loving your new silvery lamp!